Nathan P. Gilmour , 9 October 2013. My own Brueggemann revolution started with grammar: the main way that Israel articulates the core testimony about YHWH is in the form of verbs. I’m not sure I would have arrived there on my own; after all, the church culture into which I converted and the theological traditions that I inherited as a Christian-college student were very adjective-heavy: those in a systematic mood might say that God is simple, immutable, omniscient, omnipotent, and omnipresent, and even those who preferred fewer Latinate syllables might talk about God as good, just, mighty, and so on. When we encounter the great narratives of the Exodus and the prophetic oracles of Isaiah and Jeremiah, the God whom we’ve already established shows up there, and we remain relatively comfortable with our god-concept, perhaps even when the narratives should make us most uneasy. It’s the story, and the verbs within that story, that this sort of theology posits as the logically prior God-assertions. Contrary to the way I learned to think about God–more by the atmosphere of worship than by former catechesis to be fair–the narratives in which YHWH acts hold logical priority over the poems about God considered abstractly, and although the Old Testament does not provide its own singular key to good Bible reading (it provides a plurality of keys, but that’s for another essay), Brueggemann’s approach, in which the verbs make the nouns possible and the adjectives are shorthand for the narratives, strikes me, thirteen years later, as a compelling way to approach the text. To name the verbs at the core of the Old Testament’s testimony isn’t difficult: YHWH creates, judges, delivers, gives, speaks. 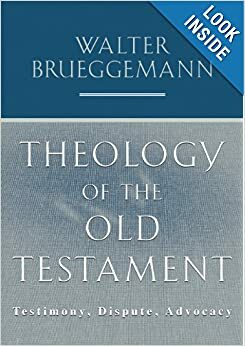 But Brueggemann’s insistence on the literary structure of the Hebrew Bible is what shines: he insists on a reading of the texts that doesn’t construct a category called “deus” (or whatever language’s deus-word you prefer to substitute here) and then insert that species of entity into the Old Testament narrative. Instead YHWH is a character whose life unfolds in the course of YHWH’s interactions with Israel, someone whose existence precedes essence (no, Michial Farmer did not take the essay over there). One finds out who YHWH is by telling the stories of YHWH, and that means one perpetually learns not only YHWH’s literary personality but also what sort of character, ontologically and cosmically, lies within and beyond those stories. For a Bible-loving Protestant like me, the best result of this structure of priorities is that Brueggemann refuses is the easy recourse to “anthropomorphism” as a reason not to take the text of the Bible seriously. Too often, I think, Bible-readers eagerly dismiss what the text actually says, condescending to folks like me with assertions like “The Bible says it that way so that it’s not over the heads of morons like you.” (Generally they’re too polite to call me morons at first, but I do have a Socratic streak to me, and nothing brings it out faster than theories that make the Bible a set of training wheels before one gets to “real” theology.) In other words, the first one to shout “anthropomorphism” gets to be the adult in the room, and those who try to make the Bible truly a primary witness get to be the simpletons. Brueggemann will have none of that. Does Genesis 6 say that YHWH regrets/repents of creating humanity? Run with it. Does Exodus 4 have YHWH calm one moment and raging in anger the next? (Or, to use the Hebrew idiom, does the nose of YHWH burn at Moses?) Then let those verbs stand in their primary spot, shaping the character of YHWH instead of subjecting the Scriptural mode of revelation to the sorts of examination that rule out a priori certain assertions about God. Sing songs about YHWH, but make sure that our songs don’t become reasons not to pay attention to the narratives. What emerges is a theology that’s genuinely Biblical, that pits the text of the Bible against certain systematic moves that, before I encountered this flavor of Biblical theology, I assumed must derive from the Bible without controversy. It’s a risky way to read the Bible, and it doesn’t lead to easy harmonies between parts. But that’s why this book is 750 pages long–a theology that starts with verbs opens up questions that need answering, and we have miles to go. Thanks. Daunting. Yet where I need to start.